After spending twenty years in the computer business, I went back to school and got a PhD in history from Stanford. I mostly now research the history of philosophy of science, especially the history of induction. I blog about that and various topics in ethics and politics. Though I don’t maintain a full-time academic post, I have nonetheless had the good fortune to teach at some great universities. 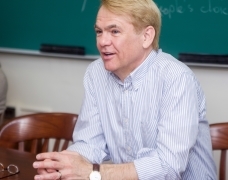 In 2015–16, I taught Contemporary Civilization in the famous Core Curriculum at Columbia University. From 2012 through 2014, I taught one seminar each fall for the Political Theory Project at Brown University. Two were on 20th-century defenders of capitalism, one on Ayn Rand specifically. I taught similar seminars and ones on history of scientific method for several years at Stanford University. In 2011, I taught a course on history of science at Stevens Institute of Technology. I received undergraduate and graduate degrees in electrical engineering and an MBA (three degrees in five years!) at Case Western Reserve University. My first commercial invention was a device I designed in high school to diagnose Sonitrol security equipment. 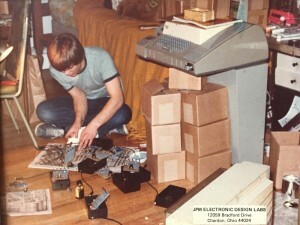 Here I am assembling some units, in my bedroom, around 1978, gooping them with epoxy so no one would steal my design. That Teletype Model 33 was for a weather station that I never did finish building. I am inventor on four US patents, three for software work at Epiphany, one for hardware I designed at Picker International in my engineering grad-school days. The main theme of my academic research is that the philosophical problem of induction is an artifact of a bad turn taken in the early nineteenth century, by which induction came to be conceived as a logic of propositional inference that depends on a suppressed uniformity principle. In antiquity and from Bacon to Whewell, induction was instead conceived as a logic of classification. My latest large project was a two-volume Latin edition and the first ever English translation of Jacopo Zabarella’s On Methods and On Regressus. Harvard University Press published it in their I Tatti Renaissance Library in 2014. I am now writing a comprehensive history of induction from Socrates to Popper. I blog on induction and various topics in ethics and politics, generally with an historical perspective. I have long been a student of Ayn Rand’s philosophy of Objectivism. From 2004 to 2010 I was on the board of directors of the Ayn Rand Institute. I founded the Anthem Foundation for Objectivist Scholarship in 2001 and was on its board, also until 2010, when I had a rather public falling out with Leonard Peikoff over my privately expressed reservations about the historical accuracy of David Harriman’s The Logical Leap. Most of my blog posts are from what I consider to be an Objectivist perspective, though some of Ayn Rand’s most prominent followers disagree with several of my positions. I live on the Upper West Side in Manhattan with my wife, the acclaimed historian, philosopher, and author Laura J. Snyder, and her son. You can reach me at mailbox@johnmccaskey.com.